ForeignCorrespondent: Is it Government of the People, by the People and for the People? Or is it People of the Government, by the Government and for the Government? Is it Government of the People, by the People and for the People? Or is it People of the Government, by the Government and for the Government? In his November 19, 1863 Gettysburg Address, President Lincoln said "government of the people, by the people, for the people, shall not perish from the earth." Were he still around today he might conclude that what the Civil War couldn't accomplish, today's politicians are close to doing--that is, destroying a government from within that was established to serve the people, not the other way around. In a recent poll 88 percent of Americans said that 'the government is in charge of the people.' That includes 83 percent of Democrats, 88 percent of independents and 94 percent of Republicans. Lincoln must be spinning in his tomb. What happened? Well, for one thing, another recent survey revealed that two of every five Americans today say the United States is evolving into a socialist state. That's 40 percent of the population; not a bunch of fanatics out on the political fringes. It is just one of many indicators that show Americans are worried that the federal government is growing too large. To be fair, 36 percent disagreed that the U.S. is turning into a socialist nation and about 25 percent of respondents expressed a neutral view or said they were unsure. Nevertheless, when you have 88 percent of a scientific survey saying that government is charge of the people and another 40 percent saying the nation is plummeting into socialism, that should get your attention. It certainly got mine. Not that I wasn't already sensing this anyway. After all, with our forced march into socialized medicine (which is what Obamacare is) we are allowing one-fifth of our economy to be controlled by Big Government. Add to that the fact that most of us pay at least 50%-60% of every dollar we earn in taxes (federal, state, local, etc.) is it any wonder that 88 percent of us feel we are being hosed by Big Brother? Does the phrase: "Jeder nach seinen Fähigkeiten, jedem nach seinen Bedürfnissen!" ring a bell? Perhaps it will in English: "From each according to his ability, to each according to his need." It is the basic tenet of Communism as espoused by Karl Marx in his 1875 treatise. If you listen to Obama long enough this is what he says over and over--though not in those exact words. He talks about the need to redistribute wealth by raising taxes on the wealthy because, he says, the wealthy do not pay their fair share. Never mind that Congressional Budget Office recently revealed that the top 1 percent of income earners paid 39 percent of all federal income taxes--three times their share of income at 13 percent. Meanwhile, the middle 20 percent of income earners (the REAL middle class) paid only 2.7 percent of total federal income taxes while earning 15 percent of all income. Fair? Hmmm. Let's do the math. Those numbers mean that the top 1% (those Obama and his socialist minions believe are NOT paying their fair share) paid about 15 times as much in federal taxes as the entire middle 20 percent even though the middle 20 percent earned more income. Fair? Let's look at the bottom 40 percent (those Obama loves and who LOVE Obama). The CBO and IRS (OK, I know the IRS is not the most reliable source these days) say that the bottom 40 percent of income earners, instead of paying some income taxes to support the federal government, were actually PAID cash by the IRS equal to 10 percent of federal income taxes as a group. Fair? Or unfair? Any reasonable person would conclude that this system seems more than fair. But Obama is NOT reasonable. In fact, he and Karl Marx think very much alike. To Karl Marx and to Marxists such as Obama, the very fact that the top 1 percent earn more income than the bottom 99 percent is not fair--no matter how they earn it. As Marx said: capitalists are greedy. Obama apparently agrees. Therefore, the state must take more from the top 1 percent until they are left only with what they NEED. That way the bottom feeders and others who refuse to work can gorge themselves at the government trough. Census figures show that more than one in three Americans live in households that receive means-based government assistance. In return they continue to vote for politicians who give them stuff--i.e. food stamps, welfare, grants, loans, unemployment, etc. Incentive, self-reliance and self-respect are relentlessly weakened and eventually destroyed by such overreliance on government handouts. Sadly, a too many Americans are simply blinded to this fact. 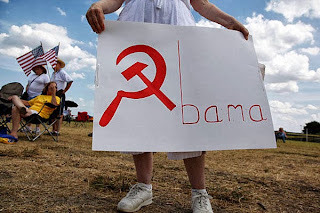 They don't see (or refuse to see) that Obama is leading us in an inexorable stride toward socialism with Obamacare and his refusal to reign in government spending two shining examples of this stratagem. I know that right now the United States may not meet the classic definition of socialism which describes it is the collective or governmental ownership and administration of the means of production and distribution of goods. So far that hasn't happened here. Not yet. But when a capitalist nation's economy is controlled more and more by colossal and inefficient government rather than by savvy private sector investment and robust competition that is a recipe for disaster. Don't believe me? Consider the disastrous $600 million rollout of Obamacare in the past few weeks. If you are satisfied with THAT kind of performance, then you, Karl Marx and Obama should get along quite well in a socialist state. As for me, I'll take my chances in a nation that rewards, as Thomas Edison once said, inspiration and perspiration--and allows you to keep most of what you lawfully earn. What is unfair about that?